THE NATURAL HAVEN: Quick Fire: Should you trim midshaft splits? Quick Fire: Should you trim midshaft splits? 'My hair is riddled with midshaft splits and I think they came from a combination of using heat and a new brush. I do not want to cut my hair though, in part because it is not breaking and I do not want to lose length. This is a really common question, I am actually surprised I have not answered it before. My answer would be if your hair is not breaking, you can probably get away with not trimming and all you have to do is be aware that your hair is damaged and needs more care. All strengthening you do is temporary so I would focus instead on gentle handling - read here to see why. Have you had midshaft splits? Did you have to trim your hair as a result? Please vote in the poll! The only time I've had mid-shaft splits was when I first went natural and read about using a Denman brush on damp hair. Then I got mid-shaft splits. As I have fine hair the splits spread in my hair strands so I just ended up cutting my hair shorter and stopped using the the brush. The Denman on wet hair did me in too. I also got mid-shaft splits. I love the brush, but it shredded my hair. Wow. I noticed a few not many but I do use a Denman on my wet hair before twisting! I hope its not too problamatic. I ge the best twistouts with my Denman! I would do a keratin treatment.maybe brazilian blow out zero or BKT. Maybe when it has grown out longer you will feel more comfortable to cut it off. I was plagued with mid strand splits for years; I big chopped in 2009 and am still wearing a tapered TWA due to the wanton way I combed my hair. 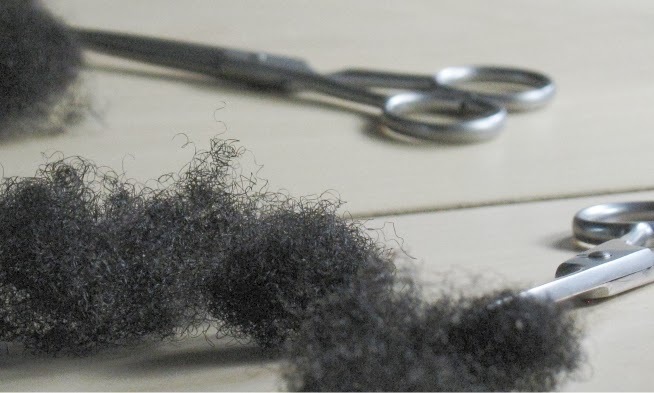 I have medium density fine strands, my texture would be described "LO-cottony" or "4c". I noticed more splits as my hair grew longer. My crown hair was riddled with splits. I was cutting my hair several times a year due to the damage. 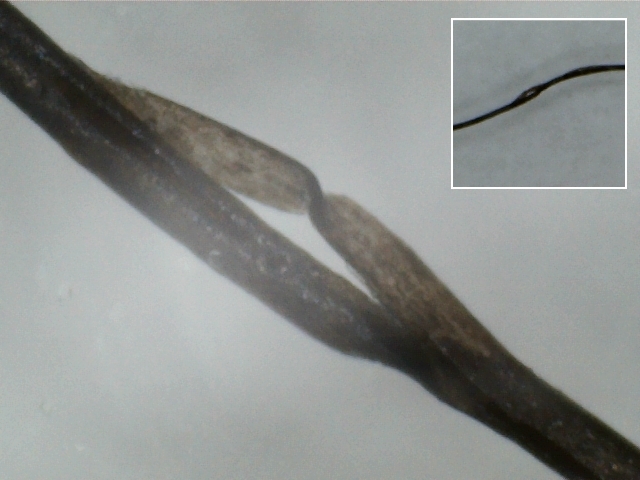 I believe mid shaft splits are caused by excessive tension during combing and detangling, as well as excessive styling techniques. I now wear a comb through wash & go, handling my hair as minimally as possible. I started taking better care of my hair, "oil pre-pooing" lightly and nightly several days before my shampoo day. I condition after each shampoo using a thick moisturizing conditioner or one with hydrolyzed proteins. I GENTLY DETANGLE WITH A SLIPPERY CONDITIONER. I believe excessively handling my wet hair stretches and damages the cortex resulting in mid shaft splits. Next summer (vacation) I plan to use a UVA/UVB hair sunscreen, and will shampoo and condition my hair after swimming at the beach (or wearing a hat or scarf if I can't). All in all, once you trim the mid shaft splits you may begin to notice split ends. In the future, deep condition and handle your hair gently to prevent further damage. Be patient when detangling your hair - if you don't have the time to wash and detangle it gently, save shampooing for another day. Hi JC, really enjoyed both articles related to mid shaft splits. In the previous article you mentioned reducing excessive hair stretching. I have been plagued with these splits for 2 years, slowly chopping off my ends every other month, as well as taking better care of my hair inside and out. I wear my hair in loose braids or twists almost all the time because my tightly curled hair is unbearable to maintain in a loose state. Is there a protective style that you recommend that doesnt put too much strain on the kinks?